This is a 6-pin female header, with extra long legs – great for stacking Arduino shields. Pins ar.. This is a 8-pin female header, with extra long legs – great for stacking Arduino shields. Pins ar.. 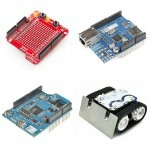 The SparkFun Joystick Shield Kit contains all the parts you need to enable your Arduino with a joyst.. The ScrewShield extends all pins of the Arduino out to 3.5mm pitch screw terminals. It also ha.. This new version corrects the pin out for the GPX and RESET pins. The USB Host Shield contains .. Retired Product This is a retired product. There is an updated version available: DEV-1276.. Retired Product This is a retired product. There is an updated version available: DEV-10628 .. Retired Product This is a retired product. There is an updated version available: DEV-10661 .. Retired Product This is a retired product. There is an updated version available: WRL-12847 ..